Rotating tyres to get the maximum wear from them has been something canny drivers have been doing for years. But there is now some confusion over whether switching your car’s tyres around is the way to go or not. Here we look at why rotating tyres may not be such a good idea, how it can eke more life out of your rubber, which tyres you move where and how you go about it. Those who don’t advise rotating tyres claim that it can have an impact on safety. It’s generally regarded as preferable to have the best tyres at the rear. This helps reduce the chances of the car’s rear end spinning round in slippery conditions. 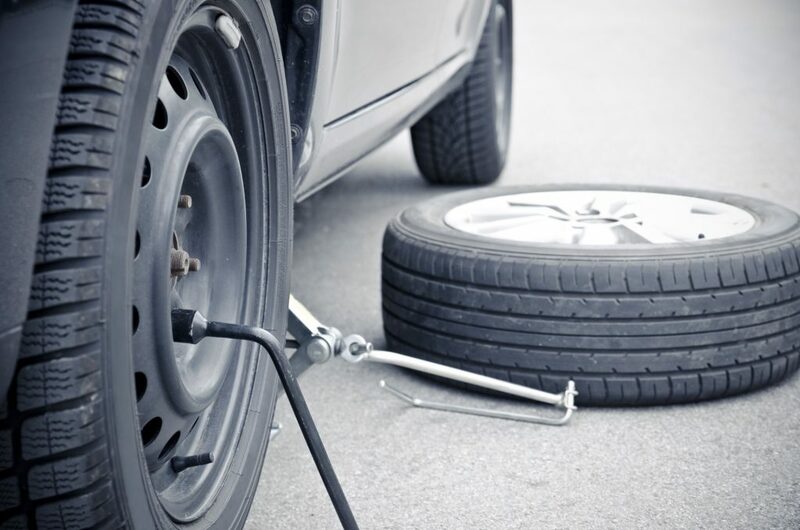 Equally, the more worn a tyre is, the more likely it is to be punctured. And if a tyre deflates suddenly, it’s easier to keep control of the vehicle if it’s a front tyre that’s deflated. For these two reasons, they say it’s safer to stick with the status quo, wait until the front tyres have worn down towards the 1.6mm legal minimum, then get your tyre retailer to put new tyres on the rear and put the old rear tyres on the front. By rotating tyres, you ensure you get the maximum amount of wear out of each tyre before they need replacing. It can also prevent uneven wear and ensure that you have four tyres that are in the best possible shape for as long as possible. Some tyre makers claim tyres should be replaced at 3mm for maximum performance. Others insist you can wear them down towards 1.6mm. Consider how the weight is distributed around your car. At the front there’s the engine, gearbox, usually the battery, air-conditioning unit and all the electronics. At the rear is the fuel tank and the luggage. The weight over the rear tyres fluctuates depending on what you’re carrying and when you last visited a fuel station. The weight at the front is fixed so it makes sense that with more weight over them, front tyres wear faster than those at the rear. In addition, there are steering and braking forces being transmitted from the front tyres to the road. And in many cars, engine power is also going through the front tyres. Which tyres do you move where? Rotating tyres is different depending on the type of tyre and whether the car is front, rear or all-wheel drive cars. Here’s what tyre company Bridgestone recommends. These are denoted by arrows on the sidewall. It means their tread pattern has been designed to work in one direction only. With these the front tyres swap with the rears, staying on the same side of the vehicle. Move the front tyres to the rear, staying with the same sides. Replace them with the rear tyres but move these to the opposite side. The rear right will go to the front left, the rear left to the front right. Again, the front tyres swap with the rear. But while the rear tyres stay on the same sides, the front tyres swap: front left to rear right; front right to rear left. The tyres swap from front to back and left to right. So the front right swaps with the rear left; the front left swaps with the rear right. As ever when you’re working on a car, safety is paramount. The easiest and safest way of doing this is with the kind of car lift you’ll find in most garages. You simply lift the car off the ground, swap the wheels around in the relevant sequence above and the job’s done. If you don’t have a car lift, you’ll need to do it using a jack and a spare wheel, on flat, solid ground with the handbrake on. If your car doesn’t have any kind of spare wheel, you’re best taking it to a professional. These are the five steps if you’re working on a front-wheel drive car. Jack the car up at the FRONT LEFT and remove the left-hand front wheel (for the purpose of this example). Replace this with the spare. Let the car down off the jack. Jack the car up at the LEFT REAR. Remove the left-hand rear wheel and replace with the one you took off the front. Move the jack to the FRONT RIGHT jacking point. Remove that wheel and replace it with the old rear left. Now go to the REAR RIGHT jacking point. Remove that wheel and replace it with the wheel you took off the front. Return to the FRONT LEFT, remove the spare and replace it with the old rear right. KWIKFIT sell tyres – why do you think they don’t recommend rotation? Do turkeys vote for Xmas?